After being stripped of all their possessions, four heroes are forced to go and rob the local mall for all the equipment they need for their next adventure. 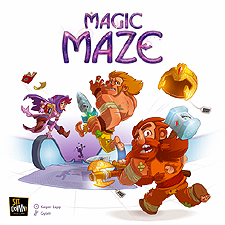 Magic Maze is a real-time cooperative game, essentially played in silence, that will turn your gaming habits upside-down. the player allowed to move the characters north (for example) is the only one who can do it. It's therefore up to them to to understand when it is appropriate for them to play, as their companions can only stare at them, or place the "Do something!" pawn in front of them, and hope they will react! You must truly work together to help the heroes explore the mall, steal the equipment, and then get away.